Drink healthier, great tasting water at home for pennies per gallon. 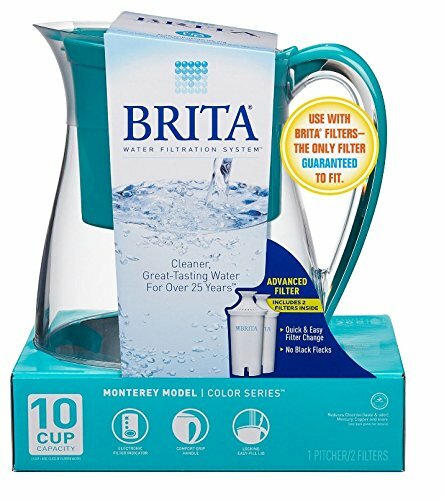 Brita® Monterey Water Filter Pitcher is BPA free, and reduces chemicals commonly found in tap water. Filter out the taste an odor of chemicals like chlorine, copper, mercury, zinc and cadmium. Use the filter indicator to track when to replace the advanced filter. With a capacity of 10 cups and a modern rounded look, this pitcher is shaped perfectly for your home or office. Pour easy with the ergonomically designed comfort grip handle and refill without the fuss using the flip-top lid. Each water filter can replace up to 300 standard 16.9 ounce plastic water bottles, cutting down on waste and saving you money. Get great taste, less waste and more savings from Brita®. Your water-filter pitcher is ready to use in a few steps. Wash your hands before touching the filter, then flush it with cold water for 15 seconds. Insert the filter into the reservoir. Add cold tap water. The first three pitchers of filtered water may contain carbon dust. Use on plants or discard. Replace the water filter every 40 gallons or two months. Not all users' water will contain the substances filtered by our water filters.